Even if your Yorkie is not scratching, check him regularly for fleas. Yorkies are short to the ground, with long, curly hair -- making them an easy target for fleas during a walk or romp outside. Because the long coat makes it difficult to detect fleas early, it's important to be diligent in looking for the pests to avoid an uncomfortable infestation. Look your Yorkie over carefully at least once a day for any sign of flea dirt -- small black specks that are flea feces -- or fleas. Gently pull your dog's fur to either side so you can see the skin beneath it; do this in numerous spots on his head, his back and especially his stomach. Brush your Yorkie's coat with a flea comb several times a week to check for fleas or remove any that might be hiding. When his coat is dry, run the special comb through his fur; start at his head, and then move to his back and legs. End with his stomach, where fleas will move during the grooming. Every few strokes, push on the prongs of the comb to release any fleas into a dish of soapy water, where they will drown. Give your Yorkie a bath, using a shampoo formulated to kill fleas; both organic and chemical products are available. Some brands of dish soap can be used, as well. Wet your dog down, saturating his fur; scrub the shampoo in, following the same pattern of starting at his head, moving down his back and legs, and finishing up with the stomach. Do not miss any spots -- including the tail -- and allow the flea shampoo to sit on him for as long as the manufacturer recommends. Rinse him with water water, and then dry him as you normally would. Provide clean, laundered bedding for your Yorkie after he has been shampooed. His bedding should be washed several times a week to kill any fleas that have come into the house with him, as well as any eggs waiting to hatch. This can prevent new fleas from reinfesting your Yorkie. Vacuum the house thoroughly every few days to catch fleas that have come in on your Yorkie's fur. Throw away the filter bag, or empty the canister and wash it out with hot, soapy water to kill any eggs. Keep your Yorkie healthy with proper diet, exercise and water intake. Fleas and other pests look for and thrive on ill pets. A dog who is active, fit and eating properly can discourage fleas from attempting an infestation. Some non-toxic, all-natural herbal sprays -- such as rosemary and citronella -- can be sprayed on the Yorkie's fur before allowing him to play outside for a few hours. The natural repellent encourages fleas to jump off the dog before he brings them inside. Read the labels carefully on any flea products containing chemicals; certain pesticides can cause seizures or death in dogs, especially if a large dose is ingested. 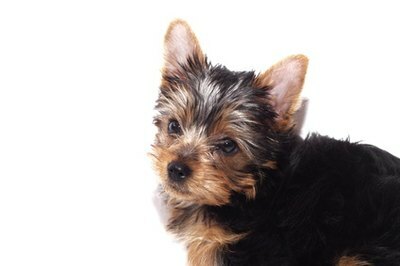 Yorkies in warm, humid areas are more likely to encounter fleas. What Happens When Cats Eat Fleas? Can There Still Be Flea Dirt After Fleas Are Gone on Cats? What Makes Yorkshire Terriers Itch & Scratch a Lot? Can Cats Die From Fleas?